Social media and YouTube are lighting up with images of women with striking jawlines because of the latest techniques in the use of dermal fillers to strengthen and contour the jawline. Over time, the shape of the lower face changes, as the bone of the jaw begins to thin (yes, all of us get osteoporosis of the jaw!) And another change with aging, which makes changes in the contour of the jawline more dramatic, is when the chin fat pad begins to go away giving the appearance of a more ‘concentrated chin. This atrophy of the chin fat pad gives rise to what we call a “pre-jowl” depression. The end result of the loss of bone (especially at the angle of the jaw) and the loss of fat in the chin is a prominent bulge in the middle of the jawline (referred to as the jowl). 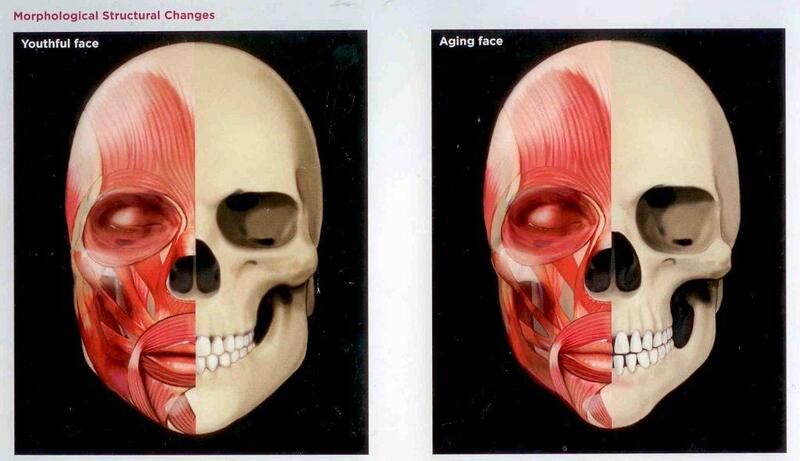 This image shows the facial skeleton in our youth (left) and as we age (right). Note the loss of volume in the jawbone, especially in the angle of the jaw. Fillers help correct for the volume that is missing. Dermal fillers can replace the volume lost in the jawline. The correction begins with dermal filler added to shape the angle of the jaw, and then are also added to the area just in front of the jowl (the pre-jowl depression) and finishing with the chin. Within minutes, the dermal fillers contour the line of the jaw, creating a smooth, younger look. The filler does not make the face look bulky, and only restores the natural fullness in the lower face which has gone away over time. The goal of dermal fillers is to restore a youthful shape to the jawline by strategically replacing the lost volume in the jaw. This enhances the contour of the jawline and minimizes the appearance of the jowls. During your consultation, Dr. Szachowicz will demonstrate the value of enhancing the contour of your jawline. You can determine if you are a candidate for jawline fillers, by noticing if you can see a ‘jowl’ starting to form along your jawline, especially when you look down. The treatment with dermal fillers is performed with micro-cannulas so there is minimal bruising or swelling. The results are immediate!